The PDF Export view/window lets you export a storyboard project as a PDF file. For tasks related to this window, see About Exporting to Portable Document Format (.pdf). Select Windows > PDF Export. Lets you select a profile for the export. Opens the PDF Profile dialog box from which you can edit a selected profile. By default, the export range is set to All, which means your entire storyboard project will be exported. 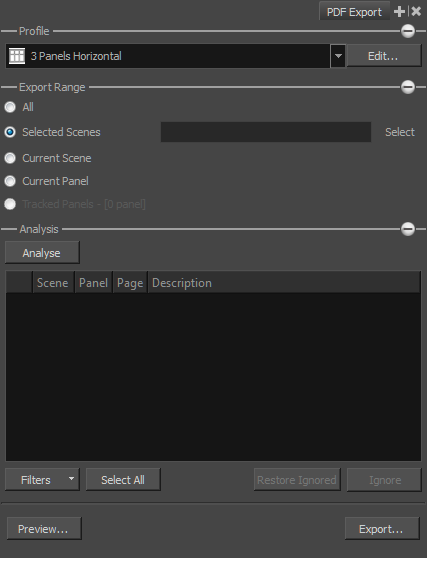 Select this option and click Select to open the Scenes Picker dialog box in which you can select specific scenes to export. Exports only the currently selected scene to PDF. Exports only the selected panels to PDF. Exports panels that are marked as tracked. The number of tracked panels will appear beside the option—see About Track Changes. Starts the analysis of your PDF options. If no issue is encountered, the list will remain empty and the word Done! will appear beside the Analyse button. If issues are encountered, they will appear in the list area. The scene, panel, and page numbers will be indicated, as well as a description of the problem found. A menu will lets you select the type of issues you want the analysis to display. Options include: Text Overflow, Text Overlap, and Camera Pan issues. Resets an ignores issue and removes the red X beside it in the list. Removes an issue from the list of issues encountered during the PDF analysis. Generates a PDF preview of the selected scene(s). If you select more than one panel in a scene, the complete scene will be previewed. Exports a PDF file of your storyboard.